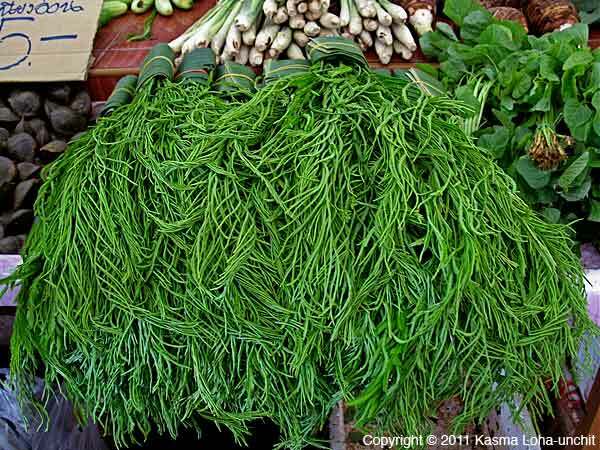 Cha-om, a tropical member of the acacia family (Acacia pennata) native to mainland Southeast Asia, is a well-loved herby vegetable among Thais, Cambodians and Laotians. 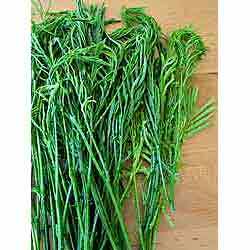 The parts that are eaten are the ferny young leaf shoots and tender tips before the stems turn tough and thorny. It has a particular fragrance that may seem unpleasant at first to the unaccustomed, but when it’s cooked up, it’s so tasty that most people can’t stop eating it and the aroma is just part of the package and soon becomes quite likable. This happens a lot whenever cha-om is cooked up in my cooking classes. post at the very bottom (scroll down). Cha-om is a small shrub with prickly thorns on its branches and stems, though I hear breeders have come up with a thornless variety I have yet to personally come across. 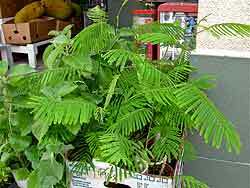 In tropical Southeast Asia, it is a fast-growing shrub that puts out new shoots year-round and most robustly during the rainy season. People in some regions, particularly the North, prefer to eat cha-om in the dry season since cha-om grown during the monsoon season tends to develop a tartness and has a much stronger smell. Growers prune the shrubs regularly to harvest the young shoots, wearing long gloves to protect themselves from the nasty thorns. 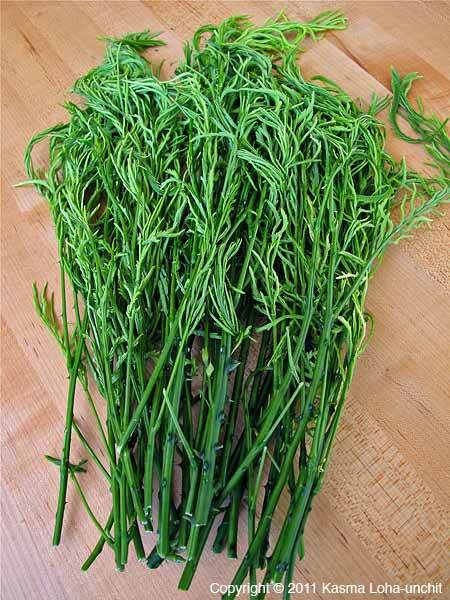 A mature plant can put forth enough shoots for cutting every three days or so. In the more temperate climate of northern California, growth is less profuse and the plants need protection from the cold. 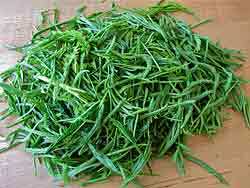 They stop producing new shoots when temperatures dip in late fall and stay semi-dormant through the winter. 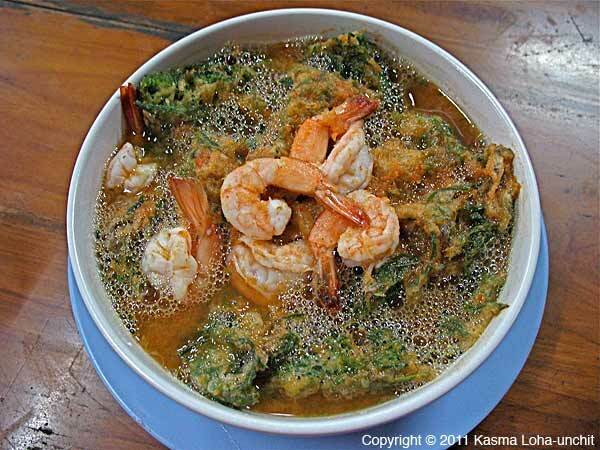 Cha-om egg squares are also frequently cooked in a spicy sour tamarind curry with shrimp (kaeng som). 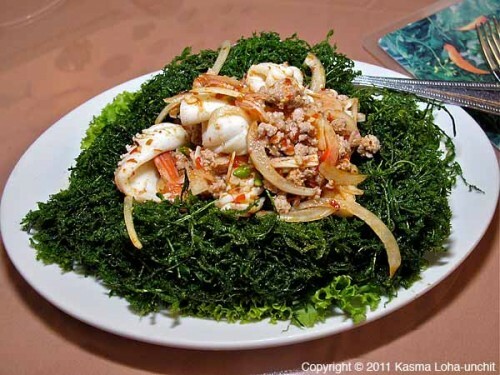 One of my favorite restaurants, Mallika, located in the outskirts of Bangkok, makes a fabulous crispy fried cha-om in a ferny nest, topped with a hot-and-sour sauce containing squid, shrimp and chopped pork (yam cha-om gkrawb). 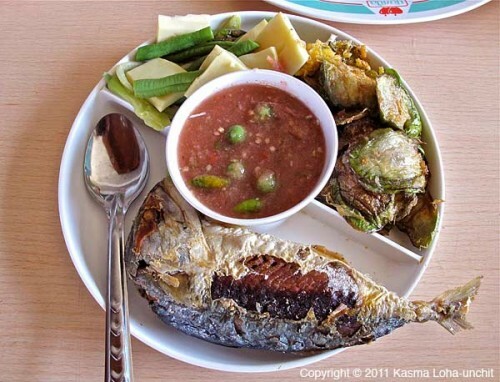 It’s one of the first dishes people in my Thailand travel groups get to savor as I usually take them to Mallika for lunch right after picking them up from the airport. 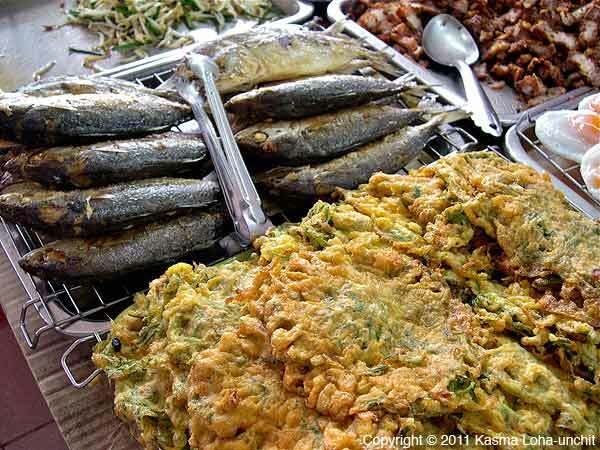 Most fall for cha-om and look forward to eating more of it in other dishes through the trip. Because of its fairly assertive flavor and higher price, cha-om is usually not stir-fried by itself like other leafy green vegetables, but is instead used much like an herb to flavor other things cooked with it. 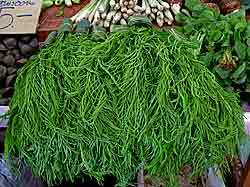 For these reasons, it is sold in small bundles in markets across Thailand. 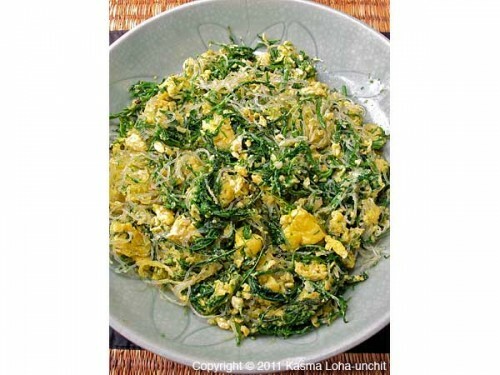 Eggs go especially well with cha-om and in my classes, we make a delicious stir-fried cha-om with eggs and bean thread noodles. 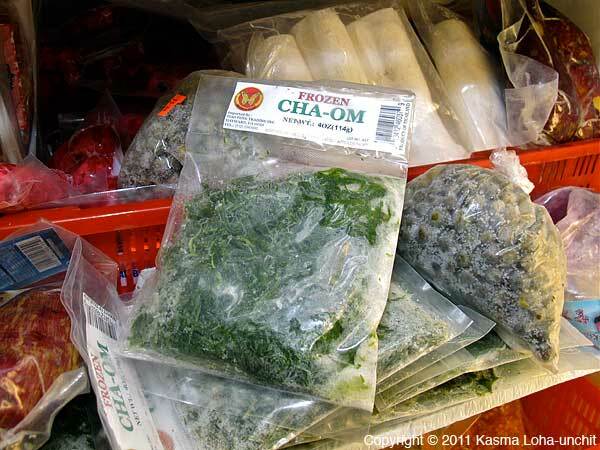 Starting last spring, we’ve been lucky to be able to get cha-om fresh in the Bay Area during the warmer months beginning in April until the weather turns cold in the fall. Being a tropical acacia, cha-om needs warmth to enable it to put forth new shoots. However, there’s only one store I know of that carries the fresh shoots and that’s Mithapheap, a Cambodian market on International Boulevard in Oakland. [Update, May, 2014: Lao Jaleune Market, formerly Heng Fath Market, on 23rd Street in Richmond, CA also carries it on occasion.] Last summer the store even had cha-om starter plants for sale. 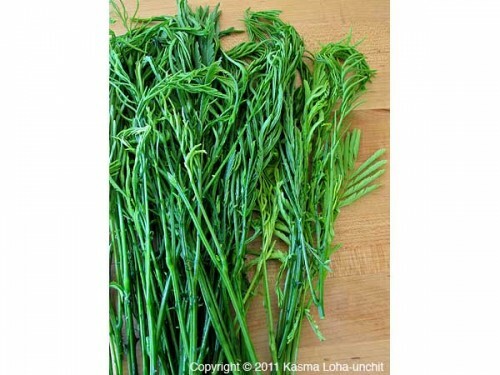 But the supply is very limited and disappears quickly in spite of its price (retails for around $15 a pound). Sam, who owns Mithapheap, tries to carry as many of the tropical herbs and vegetables that his Southeast Asian clientele craves and misses after immigrating to this country. He’s made an arrangement with farmers he knows in Modesto to grow many of these exotic produce. Among them is cha-om. During the growing season, Sam drives down to the farm two to three times monthly, usually late in the week (often Thursdays) and the produce would be available over the weekend. 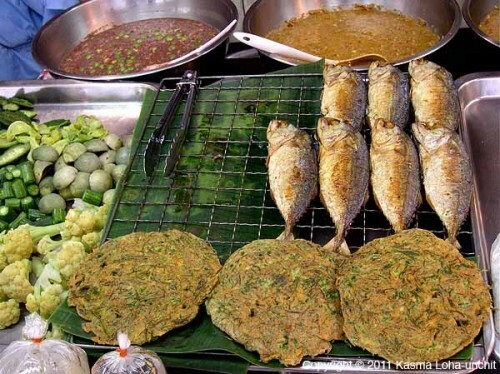 Cha-om is usually gone within a few days. Since both Michael and I are very fond of cha-om, as are many of my students who’ve been introduced to it, Sam would call or email me whenever he’s been to the farm and brought back cha-om. As soon as I receive the message, I would dash down to the store to pick up some before it disappears and then shoot off a message to my students. Sam is the main fresh cha-om supplier in the Bay Area and many of his big Southeast Asian customers, including some restaurant owners, often place special orders with him and are among the people he would contact whenever he brings cha-om back from the farm. Short of being able to get cha-om fresh, it is available for a lower price in 4-oz. packages imported from Thailand in the freezers of several East Bay stores (haven’t checked the Cambodian markets in San Francisco which most likely would have it). Mithapheap sometimes has frozen packages of de-stemmed leaves which make it easier to use and you get more for the same weight. 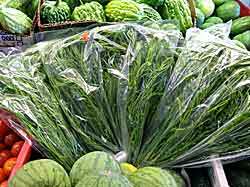 But most frequently, the frozen packages contain cha-om still on the stems. 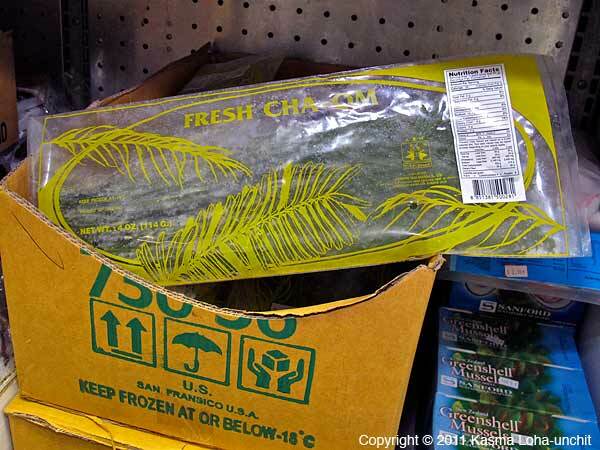 The Laos International Market two blocks further down the same street also regularly carries frozen cha-om and a third store in the same vicinity to check is Thien Loi Hoa on East 12th Street at 12th Avenue. Not only is it delcious, cha-om is a nutritious vegetable, high in vitamin C and beta-carotenes. 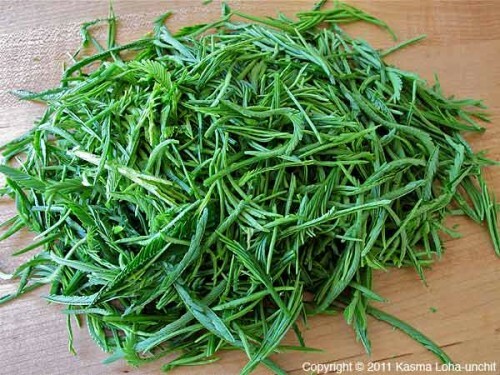 It is good for the heart and is known to be an anti-cancer agent. There’s nothing like a natural food that tastes great and, at the same time, is good for you! Fresh cha-om from Sontepheap market in Oakland. Notice the prickly thorns on the lower part of the stems. 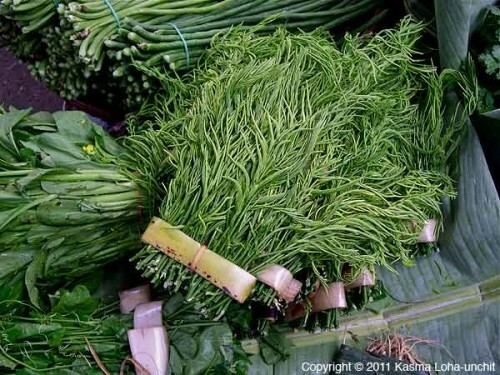 De-stemmed cha-om leaf shoots and tips ready for cooking. Cha-om egg squares to accompany nam prik and fried fish in the next picture. Nam prik plah too at Nong Beun in Inburi. 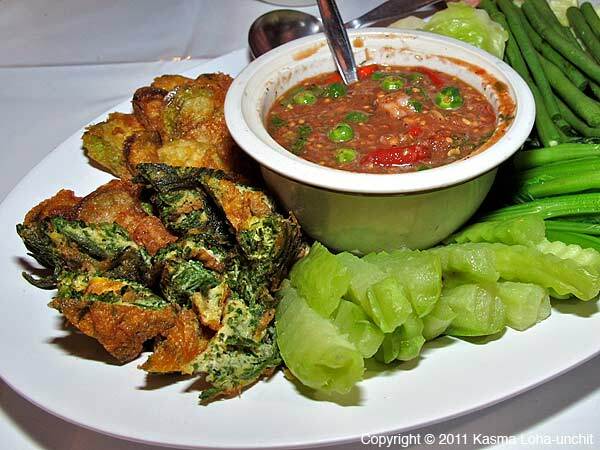 Nam prik with cha-om egg pieces at Mae Sa Valley Resort. Cha-om egg rounds at Or Tor Kor (Aw Taw Kaw) market. Cha-om omelette and fried mackerel at a rice shop in Nakhon Si Thammarat. Sour tamarind curry with cha-om egg squares at Chula in Sukhothai. Crisp-fried cha-om with hot-and-sour sauce, Mallika. Cha-om sold in small bundles at Hua Hin market. Cha-om bundled with banana leaf in Krabi market. 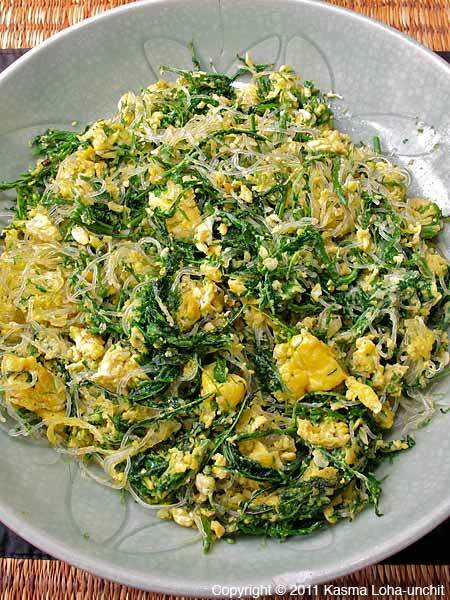 Stir-fried cha-om with eggs and bean threads. 4- to 6-oz. 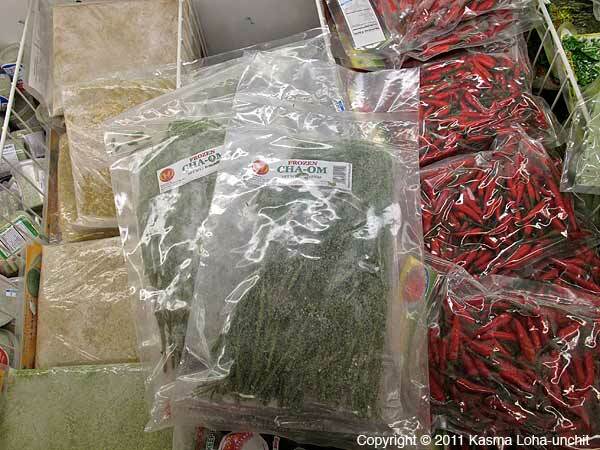 packages of fresh cha-om, Sontepheap Market. Cha-om plants for sale at Sontepheap. 4-oz. frozen packages of de-stemmed cha-om at Sontepheap. 4-oz. 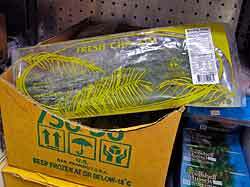 frozen packages at Laos International Market. 4-oz. 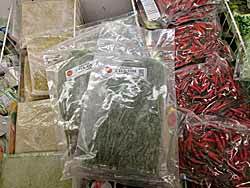 frozen packages at Thien Loi Hoa. This entry was posted on Friday, May 13th, 2011 at 12:05 am	and is filed under ingredient, Markets. You can follow any responses to this entry through the RSS 2.0 feed. You can leave a response, or trackback from your own site. 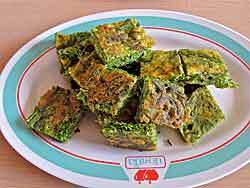 What is the taste of this Cha-Om leaf? Is it sour? If yes, so the plant would be the same with ours in Sulawesi island of Indonesia. We call it “Semba” or “Cemba”. It is a favourite dish with fish and black curry, fish with coconut grater, meat soup curry, etc. I wouldn’t call it sour. 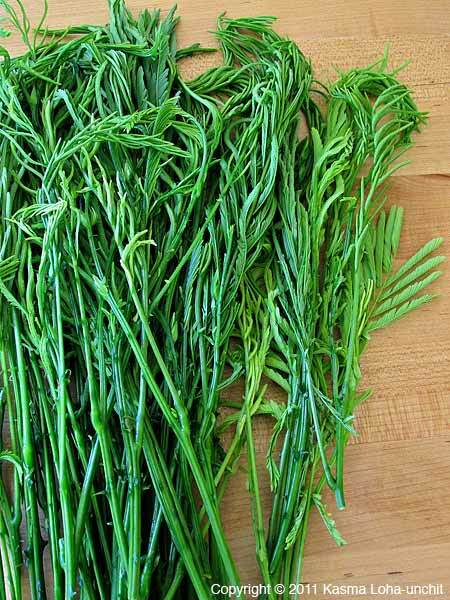 I’m not sure how I would describe it – not a whole lot of flavor but very good for texture. From the photos, can you tell if it looks similar? Yes for sure, it is very intersting to see, because the plant is very similar, it has thorns with bi-pinnate leaves. We put the older leaves to the cuisine to get more fresh sour in soup or broth. One afterthought for those who are new and will cook with it. 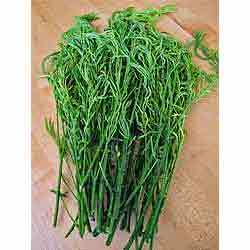 One buys it in a bunch or spray, about 6″ – 8″ long. 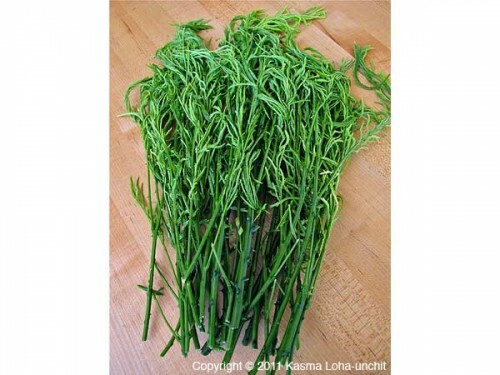 The tip is tender and, like asparagus, the stalk gets tougher closer to the main body of the plant. Fan out the cha on in one hand, like you would a deck of cards. In the other hand, I take a meat cleaver or any longer, NOT serrated, robust knife and hold it at a 45 degree angle, with the top edge tilted away from you on a cutting board. I raise the knife and, holding the cha ohm on the tough end, lower the knife so it pressing firmly against the vegetable. Draw the cha ohm toward you. At the tender area, it will separate itself. Flip the cha ohm and do the other side, and repeat both sides again, to get it all. The next inch, try cutting off and chewing some. If you like it, use it, if not, don’t. Sometimes I like having the “pieces” in the dish, for example in gansom that is like a soup, and sometimes I would not want that texture of sharp-ish pieces as they don’t cook to softness like the rest, but seem also fully digestible. What a terrific blog post! VERY clear pictures of cha om, one of my favorites, in all of its wonderful forms. Excellent information and good writing all around. Kudos to the author! When I first tried cha om almost ten years ago, I could not find ANY information at all. My wife and I did not always have the time to whip up a batch every time needed, so I used to make cha om chub kai casseroles. Put all the beaten eggs, beaten with some milk, some salt and pepper, into a 9″ x 11″ glass baking pan greased with butter or bacon grease or Pam, chop up the tender part of the cha om stems and leaves and drop the cha om around on top of the eggs. Bake at 325 or so until solid. Take out, cool, cut into 3″ squares, wrap individually, and freeze. Just microwave a square anytime needed. The only addition might be to mention it goes well with some western stuff, too. Here in Bangkok, street vendors often have the cha om chub kai as a flat pancake, but I’ve experimented and it goes great as an omelet with cheeses and mushrooms, and used in sphagetti as you might with basil in a cream sauce. So, you can get this in San Francisco at New May Wah supermarket out at 7th and Clement. I bought it frozen a week ago. It’s sitting in my freezer, waiting for me to actually use it. I’m hoping to find a recipe to use it in; I guess I can just make an omelet with it. I love the stuff and put it in everything. Last night I made sphagetti with a carbonara mushroom (like Portobellos) sauce and lots of cha om. It’s cheap on street food tables here in Bangkok. Here’s another thing I did with it while living in St. Petersburg, FL, where it grew easily from cuttings. 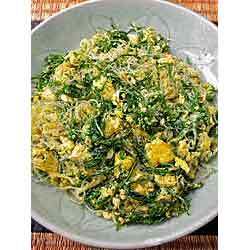 Make a cheese omelet using cha om that you cut small and beat into the eggs. Add just cheese into the omelet or also add some cut up portabelos for a meaty texture and incredible flavor. We live in Florida, can Cha-om plant grow in Florida? If so where can I buy the plant? Thanks!